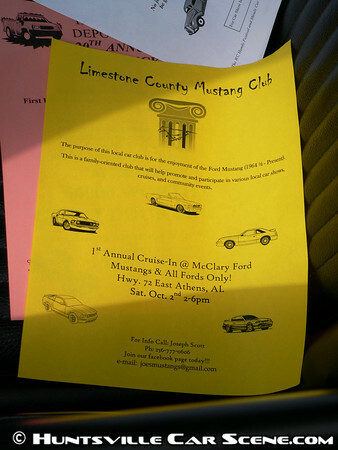 "This event is a cruise-in for show only. 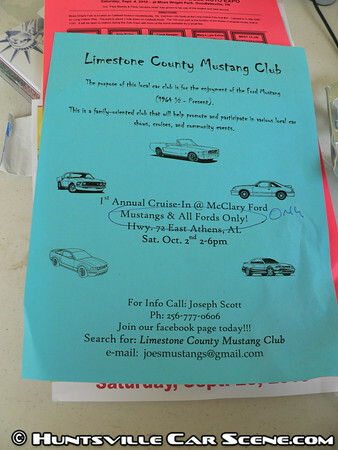 (no trophies awarded) It will be open to All Years of Mustangs and ALL Fords only! 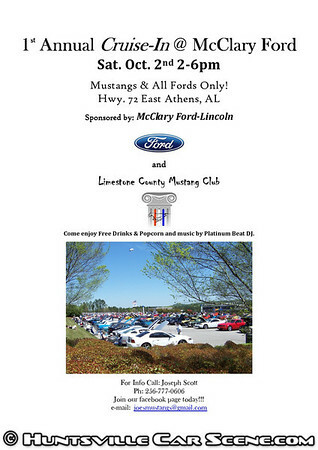 (Ford Trucks are also welcome) We will have free popcorn & drinks and a few door prizes and Music by Mike from Platinum Beat DJ. Family friendly event!" I basically missed this show by just an hour--the one hour that I was behind schedule all day. But I took pictures of the few cars that were left, and ran into a lot of the cars from the show at the Athens Cruise-in. Over 80 cars and trucks came out for this cruise-in. A great turn out for a first time event. I'll see everyone next year, hopefully on-time. Thanks Samir.............I should have an dedicated flyer for this event soon!! Awesome! The only missing information is the registration cutoff. No cutoff...............you can show up the day of! We Got Cokes, popcorn and music ready to go!!! Working on door-prizes!!! October is going to be a big month for events due to the milder weather. 110 is a bit hot for most people. Yep...............I talked to the dealership today and they are excited about the cruise-in!! I think the Madison Street Festival Car Show is the same day and ends at 2pm...maybe a 2fer day...Car Show and then cruise in. Yes.................what a perfect end to a great day!!! 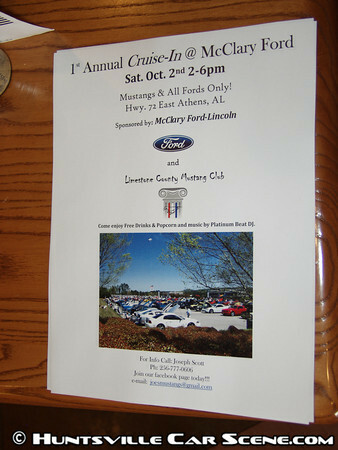 We plan to cruise up the the Athens (on the square) cruise-in after our show!! Well, looks like a 3-fer and a full day. Last edited by Samir; August 15th at 07:55 PM. We could cruise to the midnite movie and make a day of it.....LOL!! Or we could all roll downtown and turn it into a whole weekend. I saw it, and I'll post it when I get back to the office. Did you get my new flyer?? It's been a crazy week. I do have it in email, but haven't had a chance to work on it yet. Hey thanks Samir.........................you the Man! !